Combines the advantages of Tape-In and I-Link methods: Donna Bella’s Flat-Tip Extensions give the flat, comfortable feel of Tape-Ins while maintaining a 360° movement with the same strand-by-strand method as I-Link extensions. It gives the best of both methods. No Damage: The Flat-Tip beaded method is a safe and secure solution for those worried about damage to their own natural hair. Flat-Tips require only beads to install, ensuring that there are no glues, chemicals, or heat used during the application process. Mess-Free: Forget the messy residue left behind by Tape-In adhesive. Flat-Tips can be removed and reinstalled without having to clarify the hair in between, and require no solution to remove, only your pliers are needed. Long-Lasting: Donna Bella’s Flat-Tip Extensions last 3-6 months and can be reused 1-2 times afterwards. 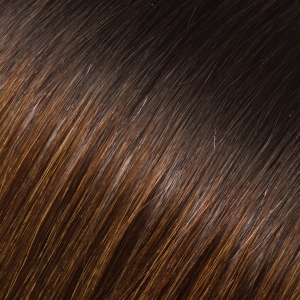 Each strand can be removed and reinstalled to maintain long, beautiful hair. Price: Flat-Tip Hair Extensions are a fabulous price for the quality and quantity of the Remy hair. Each package holds 20 full strands of hair, each weighing about 1 gram. Each strand is guaranteed to be 100% Remy human hair that has never gone through any chemicals or treatments outside of its coloring and moisturizing. You’ll get top-quality hair at the most competitive price in the market. Versatility: Flat-Tip beaded hair extensions involve a simple installation method that is extremely beneficial for new stylists. Mistakes are rare and easily fixable as the Flat-Tip extension strands can be swiftly removed and reinstalled. This method is also a perfect for those seeking small highlights or pops of color throughout the hair.